Incorporating a rustic style into one's bathroom may seem difficult when you're sifting through countless porcelain bathroom vanities that barely ascribe to your aesthetic. 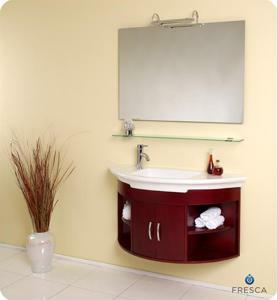 Luckily, ArtCeram has released a skinny, space-saving vanity that implements a sink with a wide surface area and plenty of storage space below, according to Trendir.com. The vanity is designed for the utmost in utility and can fit just about anywhere. It features a wide sink on top of the stand that allows water to have plenty of space to disperse and can be fitted with many contemporary faucet designs. The simple design of the piece makes it very adaptable to rustic layouts, but it can also be combined easily with contemporary bathroom accessories. The base of the bathroom vanity is a simple wooden design with one shelf and that's about it! The modern, slim and simple design is perfect for individuals who love minimalistic furnishings, and it's the perfect non-obtrusive piece that can allow other decorative accents to shine. While this sink isn't for everyone, it could be a fabulous way to update the look of one's bathroom. Would this sink work in your vision of a rustic washroom?